One year ago about 53% of internet users (nearly 1.7 billion) have purchased something online (Retail Trends Factfile 2017). No doubt it has been a really tough ecommerce fight for each of these consumers. According to eMarketer and Census Bureau, in the next 3 years, the number of online purchases will be higher, and the consumers will be more demanding. If you want to grow your ecommerce market share, use all of the SEO power and unleash its potential to the fullest. But how? Follow trends, use SE Ranking SEO software, make a daily routine and implement our tricks. Approximately 37,000 websites are hacked every day. If your online store has not yet switched to the secure HTTPS protocol, it’s high time for you to do it. First of all, Google announces HTTPS as a positive ranking factor. Secondly, as of January 2017, the sites that are not marked with HTTPS will be deemed insecure by Google. In such a way the search engine warns users about a possible leakage of personal data, for example, credit cards numbers and PIN codes. Not the best way to motivate people to make purchases from your website if you ask me. An encrypted data transfer allows the user and the resource to “communicate in a secure area” that excludes “eavesdropping” and theft. A webpage loads up to 10 times faster (compared to HTTP). To enable a secure protocol, you will need an SSL certificate obtained in an official way. Moreover, many certificates can protect your site from DDoS attacks (for example, free SSL in Cloudflare). 27% of 18- to 49-year-olds are making online purchases using their phones only. 30% of global e-commerce sales will come from smartphone users by the year 2018. Mobile shopping is the fastest growing segment in ecommerce, worth an estimated $3.2 trillion in 2017, an increase of more than $1.5 trillion in the last 5 years. Is your site ready for a rapidly growing number of mobile users? Some brands saw a 20-30% increase in conversions after optimising their site for mobile and tablet screens. Check if your site is optimized for mobile devices (you can use SE Ranking Website Audit). Strive for simplicity and speed. Don’t give the customer 50 positions to choose from. Suggest one set and a button “SHOP NOW”, the main thing – do it quickly. About 53% of mobile website visitors will leave if a webpage doesn’t load within three seconds. If you want to outperform your competitors in how fast your mobile page is loading, use AMP. It stands for Accelerated Mobile Pages. This initiative by Google is aimed to get web pages to load faster on the mobile devices by reducing their weight. This free framework allows you to optimize the HTML pages. Increase in the conversion rate and reduction in the failure rate are few more facts in favor of AMP. Ebay has been already testing it. Make sure that the text is readable without the need of left/right scrolling or enlarging; the hyperlinks are not too close to each other so it’s easy to click on them. When adapting a site to the mobile devices, it is worth considering the target audience and the sizes of their mobile screens. 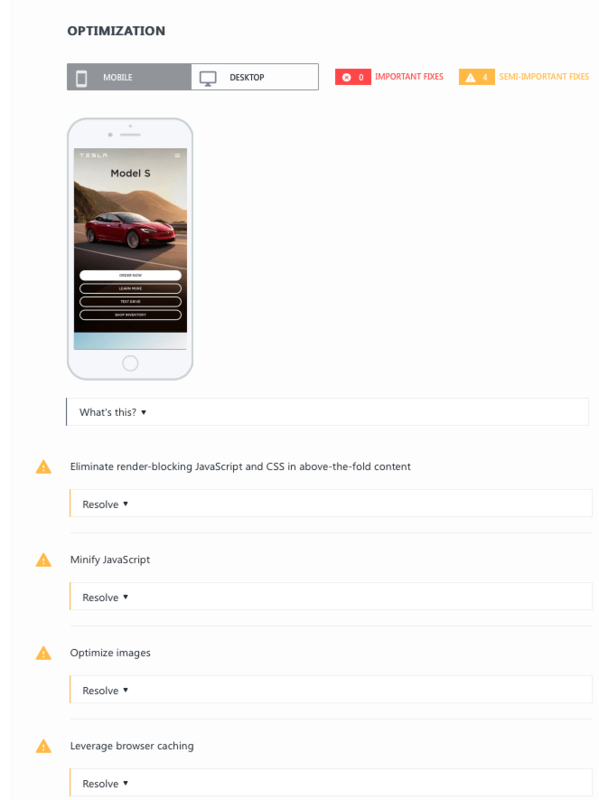 Also, many developers are now actively using the Adaptive Images script, which determines the screen size and changes the picture size to the appropriate option. 20% of search queries on Google’s mobile app and on Android devices are voice searches. Have you heard that 50% of all searches will be voice searches by 2020? Siri, Alexa, Cortana, Google Now and other voice assistants are becoming “smarter” every year. Just think about very near future. Regardless of whether your potential customer will be typing the search query or just use his voice, it’s better to get ready in advance! To optimize your site for the voice searches, expand the semantic core and add more natural-sounding phrases (adapted to the human speech). Such low-frequency queries (long tail keywords) usually contain 3-5 words and relate to colloquial speech. To get a list of such keywords, use the Keyword Suggestion Tool from SE Ranking. The tool provides a detailed statistics on the selected keywords: monthly search volume, keyword efficiency index, competition, suggestion bid, the number of search results and the rankings. According to a new research study by Blue Nile Research, the searchers use question formats (who, what, when, where, why and how) in their query 27% of the time. To be ready to give the answer to the user, create an appropriate content on your site – Help or FAQ sections. Structure the data (address, phone, price) properly using Schema.org micro-markup. Local businesses should definitely add the exact address, the most optimal driving directions and a contact phone number. Amazon has already launched its own virtual assistant Alexa which can execute several thousand voice commands. For example, it’s able to add the product to the shopping cart or calculate the discount. Personalized recommendations can increase conversion rates up to 5.5 times. Probably you know that the users from Mexico and America (or MAC OS and Windows) see different prices for the same tickets on their screens. Such “injustice” is the evidence of machine learning technologies. And you’ve most likely heard about Google’s deep learning system called RankBrain. It helps to find relevant pages focusing not on the keywords, but the meaning of the query. Google’s RankBrain is able to identify the type of websites that engage the users the most and help Google to differ good sites from bad sites based on this data. Just imagine, if website owners get access to the tons of data from around the Internet, they will know what search end users are looking for. AI SEO is still in its developing stage but in the very near future, it will dominate. In July 2017, Google has acquired an Indian startup, Halli Labs, which uses an artificial intelligence and machine learning. It definitely shows the ongoing interest by one of the largest tech companies to double down on AI and machine learning. Over 42 percent of responding consumers stated that they felt somewhat influenced by social media when making purchase decisions. The future of online shopping will definitely be connected with social selling. It’s already popular in social media giants across the world –Instagram has added a Shop Now button, Facebook has allowed brand pages to use the Buy button since 2014, etc. What will you do if you want to learn about something as quickly as possible? You will google. So make sure you’re happy with what you see in the search results that are tied to your product. If not, it’s time to take care of your reputation. SERM is a search engine reputation management, and it’s a sort of a mixture between SEO and PR. Its goal is to increase the amount and rankings of positive news about your brand (and decrease a negative influence, if possible). Monitor the web with Google Alerts and Mention. In this way, you will receive notifications of your brand mentions as they happen. Analyze the results and try to make a negative content appear lower in the search. For example, if you see a review about the poor performance of your delivery service, respond in short order (for example, in the comments), apologize and try to offer a win-win solution before the issue grows bigger. An instant reaction to the negative reviews, mentions, articles will help you avoid the online reputation issues in future. 52% of consumers are inclined to make impulse purchases. Sometimes internal links play no less significant role than the external ones. It’s worth to pay attention to the inner linking as it’s your chance to improve your positions, competently move the weight and eventually appear in the TOP search results. Moreover, in such a way you may try to persuade the users to make impulse purchases. Let’s start with the main page which usually gets the most views from other web pages. Adding internal links (categories, sets) on the main page allows both the search robots and users to go deeper through your site. As a result, the trust of search engines and the rating of your site will increase. Moreover, the users can buy more and faster thanks to the thoughtful navigation and special sets. Also the links on the main page help to share info about a new category or a brand. Keep in mind a seasonality. If one of your pages (for example, winter footwear) has reached the TOP and generates leads, use it for a summer promotion as well. Link both pages to guide the users from “winter” to “summer” content and increase your sales. 60% of consumers research a product before making an online purchase. Provide all the valuable information right in the snippet. After all, if you can get the user interested, most likely he will go to your site. Indicate the price and availability of the product; contacts. To do this, use the semantic markup (via schema.org). Install the rating widget on your site (star rating system). Set up the “breadcrumbs” and reviews module (88% of users trust online reviews as well as personal recommendations). Read how the rich snippets can boost your SEO results here. Google frankly admits that it doesn’t have enough resources to store everything on its servers. Conclusion? Never rely 100% on the search engine data. Analyze a primary information yourself using the server logs. Analyzing the server logs helps you find the most popular queries on your site. So you can get what and how the users search on your site, whether they find everything they want. As a result, you may expand both the semantics and the variety of goods. Moreover, it helps identify the most frequently crawled URLs; the client and server errors; slow URLs; “invisible” for search engine pages. After such an analysis, you will see what can be corrected and optimized to improve your positions. In this case, you can use a system for storing and analyzing logs – Splunk as well as other tools, for example, logz.io and botify.com. Small things can make a big difference. So if you want to outperform your competitors, pay attention to every detail of the ecommerce machine. Yeah, it may be some small tricks but make sure you have them implemented on your site, or you may lose. Thoughtful product filtering (it helps your visitors find a specific product, and it allows you to put the keywords into the filters and expand your semantics). Strive to set useful filters and let users choose a few filters at once. Also, the more important the filter parameter is for the user, the higher it should be on the list. Promotional products countdown. For example, “Buy within X minutes and get 50% discount”. Pop-up with a shopping cart which “follows” the user during scrolling through the pages. Make sure it doesn’t look like an obstacle. Cross-module – “You may also be interested in” (similar products or goodies that can make up a set). Gift certificates (they can increase your sales by 10%). Reminder in the shopping footsteps (if the customer leaves a shopping cart without paying, send him an email with a discount for the products in his shopping cart). 54% of shoppers will purchase products left in shopping carts if those products are offered at a lower price. Ability to search for products directly in the rich snippet (using structured data). Share your own tricks in the comments below. Let’s make a valuable list together so you can use it to boost your sales. Excellent post! I already try to use unique product descriptions and links to my blog on the product pages, but never paid a lot of attention to all the other stuff in the post. Thank a bunch! Great that you’ve found these tips useful!